I got my copy of the Open canoe association magazine through the post but I didn't get around to reading it till I came back from holiday in July. When I did read it I saw an ad for a trip in October to paddle the Spey in Scotland, led by 2 instructors from Woodlands Outdoor centre, Glasbury on Wye. I phoned to book on but wasn't to surprised to find that the trip was fully booked. I could have kicked myself for not spotting it earlier. In September I received a call that there was now a place available due to due to someone having dropped out. The cost of the trip was '275 which included transport (plus Canadian) from Glasbury., a weeks food and accommodation plus instruction. Those taking part were able to stay at Woodlands on the Saturday night ready for the early start on Sunday. Kevin Jackson and Chris Mosedale our instructors soon had all the boats loaded onto the trailer and we were away shortly after 8.30a.m. There were 9 of us on the course with varying degrees of paddling experience - from Penny and Philip who were training for their level 3 instructor to Ken who had loads of sailing experience but had never paddled before. It was a ten and a half hour journey to our very comfortable cottage (8 bedrooms and 4 bathrooms, some cottage!) at Dulnain Bridge which is about 12 miles from Aviemore. Sunday evening was my first taste of Kevin's fantastic cooking, I knew then that it was going to be a great weeks holiday. On Monday the put in was at Loch Insh. It was a still clear morning, the surrounding mountains looked beautiful in their autumn colours reflected in the still waters of the lake. Once on the water Penny very kindly took me under her wing, she had to log up teaching hours to get her next qualification, so I was lucky enough to end up with my own personal instructor. Penny showed me how to do a power stroke which immediately increased my water speed, plus lots of other tips on technique etc. The Spey starts at Loch Insh and runs 74 miles before reaching the North Sea at Spey Bay. The section we paddled on Monday from Loch Insh to Boat of Garten was 14 miles of grade 1. The Spey is quite wide with lots of fast moving riffles. It was a warm day, the scenery was superb, with all the green and golds of a highland autumn day. 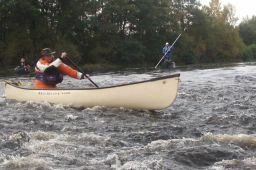 On Tuesday we put in at Granton on Spey missing out approx 12 miles of slow moving water. This 14 mile section to Ballindoch Bridge was faster more constant water. It was noticeably cooler with some scotch mist hanging about so we lost some of the fine views of Monday. Kevin and Chris had us doing lots of break ins / outs and general boat control. Phil took every opportunity to pole, he let me try his cranked paddle which he favoured. It felt very different to my own paddle so I soon handed it back. We started to see some very good sized salmon jumping. Along the banks we saw many very desirable fishing bothies. Kevin told us that some of the fishing beats command a price of '1000 a day, however it was commented on by all the paddlers that all the fishermen and ghillies we passed all week all either gave a friendly wave or called a pleasant greeting. These guys are paying huge amounts of money to fish and as for the ghillies it was their livelihood but none of them had any problem with canoeists sharing the water with them. What is it that makes the majority of fishermen south of the border so dog in the manger! 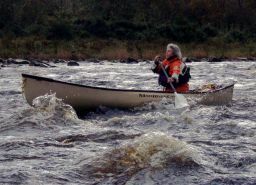 Wednesday s paddle was from Ballandauch to Craigellachie, a distance of 13 miles. We had an 8.15 start. This section had 2 rapids. The first is Black Boat rapid. We all ran this successfully. It drizzled on and off all day I had forgotten to bring my hat so I borrowed one from Phil. It was a bit too big and kept falling down over my eyes Still the way I paddle that's probably an asset. The second big rapid is called Knocando you can imagine the fun we had with a name like that. The rapid is quite long and curves round to the right. You had to keep river right all the way as river left there is a small cliff . If you got it wrong the force of the water would push you into it. We all got down without too much bother. As we paddled that afternoon the rain started to set in with a vengeance. Thursday it was decided to run the same section but to get out just after Knocando. There had been torrential rain overnight and the wind was blowing a hoolie. The river had come up a lot. The force of the water was very noticeable; it was big brown and swirling. Kevin got us to break out just above a right hand bend and told us to ferry across the river to an eddy where he would be waiting for us. Working as hard as I could I soon realized I was going to miss it. Kevin called to me to go on and break out river right where Chris would be waiting. Try as I might I couldn't get to Chris either and found myself being swept around the bend. I saw Pamela and joined her in an eddy. My heart was hammering and I felt completely out of my league. When Kevin joined us he told us he had asked us to go for those eddies just to show us what force of water we were dealing with. This was a very different river now. Breakouts became much more must do, you didn't get a second chance to make an eddy. When we got to Knocando we broke out above it river right. Kevin told us to ferry over to land and inspect. As Pamela and I got half way across a huge gust of wind swung us around, by the time we got our boats straightened up we had lost valuable ground. We both ended up paddling through some weird boils. It was like trying to paddle through treacle. Then we saw the rapid, oh dear. It looked totally different to the previous day. The only saving grace was that the water had risen so much that there was now an island river right which thankfully meant there was a chicken chute. The downside was that we would have to ferry back across to a small must make eddy. I have never put so much effort into paddling in my life. Every stroke was accompanied by a grunt of effort ( I had always previously thought this was just an affectation used by tennis players at Wimbledon) I made the breakout but my heart was thumping and that wasn't due only to exertion. Thank God for that chicken chute. 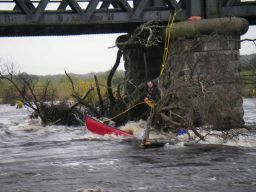 We all got down it without incident and took out just below the rapid. There was a very high and steep hillside with winding steps up to the car park. Kevin and Chris rigged up a pulley system and in no time had all the Canadians hauled up. Then it was back to the cottage for well earned tea and cake. We put the tv. news on only to find a severe weather warning for Scotland and reports of storm damage and floods. Ho hum, why is it that whenever I go on a canoeingcourse my very own rain God makes an appearance. I can see a pattern emerging here. Friday Craigellacie to Aberlour [Spey Bay]. Kevin promised us an easy ride today. After all the heavy overnight rain the river was full on. We had made an 8a.m. start because of the long shuttle. There wasn't to be any practice, just running the 17 miles of the river with a stop for lunch. The was wind up day today. Mary was given a different paddle and couldn't get on with it. She was told it was because it was a left handed Canadian paddle. Being as Mary normally only paddles kayaks she fell for it completely. Kevin also told her that as a bow paddler when they went into a hole the correct thing to do was put your hands as far forward as she could on the gunnels and throw your weight forward! The water was so fast it was just a case of enjoying the ride with very little effort. Pamela headed for every hole she could and I followed her through them, great fun. However I saw her heading for a huge hole with Chris and Kevin behind her. When I saw them both peel away I decided that discretion was the better part of valour and did the same thank goodness. I heard Mary shriek as the Canadian disappeared into the hole, only to rear up seemingly vertical on the face of the wave. A lot of bailing ensued. As we approached the coast the Spey changed character. It was split into many channels by shingle banks. 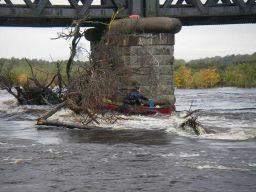 Of the 74 miles of the Spey we had paddled 73' without incident, when all hell broke loose. We rounded a bend only to see a bridge which was at a tangent to the river with very large trees forming evil strainers on each stanchion. Chris got into an eddy on river left and called us to follow him while Kevin went on to check it out. Once again I found myself in the grip of several large boils. I realized there was no chance of me making the eddy as I was still heading for the strainers at a rate of knots. I started ferrying, again grunting with the effort. I don't think I've ever been so scared, as it seemed that I wasn't going to clear the strainer. Afterwards Kevin congratulated me on my ferry. I didn't tell him it w as all down to fear and panic. I got into a small eddy and watched in horror as the 2 following Canadians both hit the strainer. All four paddlers tried to jump into the branches but all including one Canadian were dragged under the strainer by the force of the water. A few seconds later three swimmers appeared downstream but there was no sign of Ken. At last he broke the surface. His foot had been trapped in the branches and he had been held under for quite some time. Kevin and Phil rescued all the swimmers while Chris put his rope and rock climbing skills into practice and climbed down from the bridge to try to free Pamelas boat. Some 20 minutes or so later the other Canadian surfaced from under the strainer and Kevin managed to get it ashore. While all this was going on the swimmers huddled in the emergency tent to keep warm. Pamela had just had the gunnels of her boat repaired after an argument with some rocks on a Welsh river. Chris eventually freed her boat and brought it over to her and yep, the gunnels were in need of repair again as the force of the pin had creased the boat. As we set off again to paddle the last ' mile we passed a seal pup lying on a shingle bank, it was a nice finish to a great trip. That night Kevin cooked us haggis with tatties and neeps. Ian put on his highland kilt and we toasted each other with highland whisky. It was a great week by any standard and I hope to do it again.